Worldwide, the double burden of malnutrition in all forms has become a centre of debates and arguments because the major states’ failures to fight it in different levels. Also, governments are easily influenced by international organizations to maintain productionist lines to satisfy the newly created patterns of food demands in benefit to the large agroindustrial sector. As a response, food and agrarian movements are claiming for greater state’s support to local networks and self production-consumption in nutritional frontlines and traditional diets making a strong emphasis in having different concepts of healthy food. In Ecuador, the food sovereignty constitutional context, in which this research develops, has become a terrain of debate because of the cooptation process from the government and against social movements. 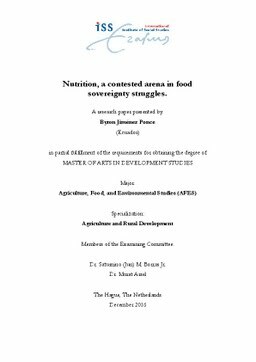 Therefore, this study analyses and unpacks those relations between the state actors and food movements to promote a different way of understanding regarding nutritional issues. Thesis Advisor Borras, Saturnino (Jun) M.